Local Bar with a friendly atmosphere. Five pool tables and many t.v.'s. 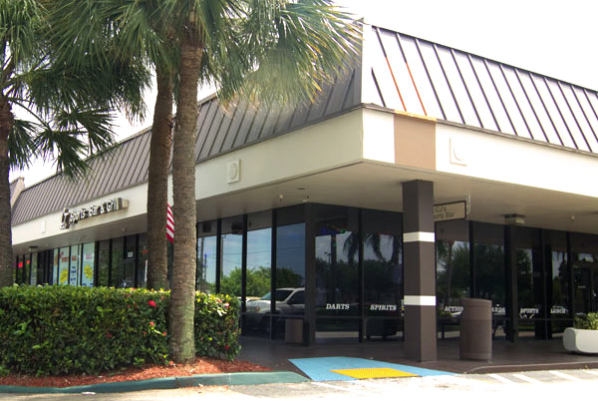 CJ's Sports Bar & Grill is located at 5020 W Atlantic Ave in Delray Beach. CJ's staff are always ready to serve, their food is consistently good and the crowd is friendly. Portion of their wings are big and tasty, and is said to have the best patty melts in South Florida. The beer is always cold and there's usually a game of pool going on. They have full size pool tables in great condition. Pool table rental is by the hour. At CJ's Sports Bar & Grill there is plenty of parking available and smoking is permitted. Prices are reasonable and they accept major credit cards. With a superb staff to serve you, great food and nice place to meet cool people what more can you ask for. Overall it is the Pub to be in! So next time your thirsty and in the mood to play eight ball head on down to CJ's Sports Bar & Grill. CJ's Sports Bar & Grill is located at 5020 West Atlantic Avenue. Delray Beach, Florida US. CJ's Sports Bar & Grill is a Tavern type of establishment offering authentic US food. CJ's Sports Bar & Grill has been serving their customers since 1970. Here at the Tavern, the owner, Laura Owen, can be helpful with answers to your questions. At CJ's Sports Bar & Grill, you will find traditional Burgers dishes for your pleasure. This location offers the best Drinks in stock. Yelp reviews give CJ's Sports Bar & Grill 5 stars on the Long Island Ice'd Tea. Nachos are some of the best in town. WebPage Depot suspects this is an individual establishment as we did not find any information on a franchise. 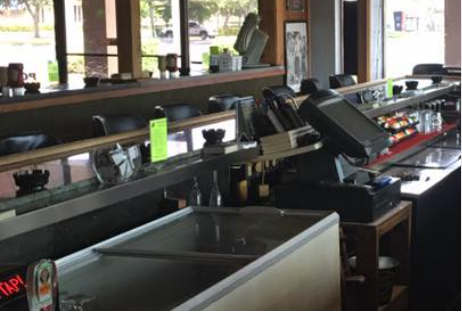 Though CJ's Sports Bar & Grill isn't fancy outside, they provide great service on the inside. There is no host or hostess here. Please walk in and make yourself comfortable. The attire here is causal, no need to put on your best coat. When you arrive you can expect to find a comfortable old style ambiance. There is no outdoor seating at this location. Need a midnight snack? Give CJ's Sports Bar & Grill a try. CJ's Sports Bar & Grill does not offer delivery at this time. To busy to eat in? CJ's Sports Bar & Grill has you covered. Call to order food for take-out today. CJ's Sports Bar & Grill does not offer catering at this time. There is no need for a reservation at this location. 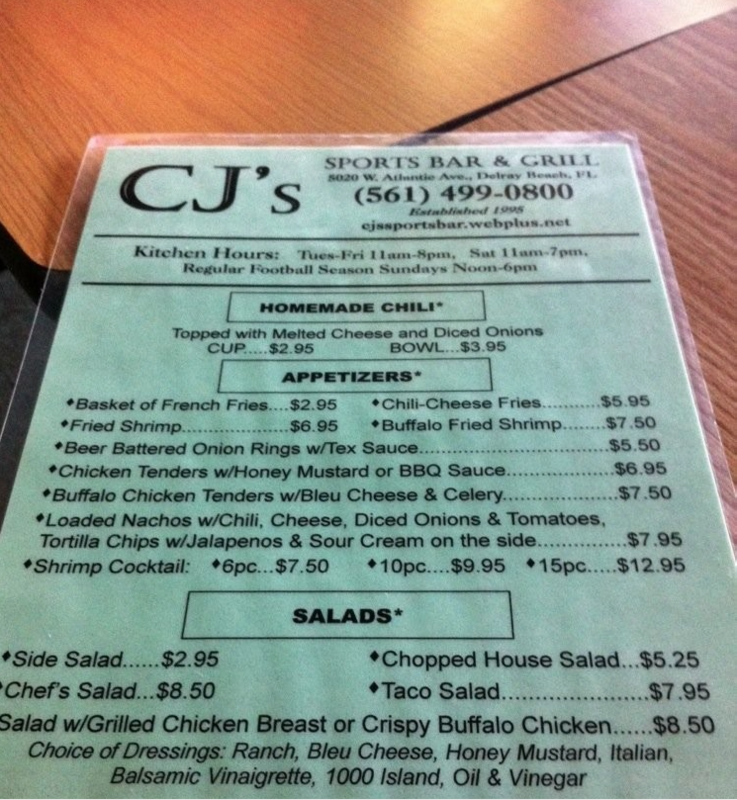 At CJ's Sports Bar & Grill, there are no reported issues with cleanliness. The lighting is fine and makes for a pleasant visit. At this site, there are tables with comfortable chairs. Bar Seating is an option at this restaurant. You will have your choice if available. The noise level here is within reason. If you like to dance, you will like CJ's Sports Bar & Grill. Get ready to dance the night away. CJ's Sports Bar & Grill is rated a 4 star establishment. The Tavern reviews provide good feedback for this place. CJ's Sports Bar & Grill is very reliable when it comes to Full Bar service. Some of the services provided at CJ's Sports Bar & Grill is Exotic Drink. CJ's Sports Bar & Grill is also known for their Grill services. The reviews brag about the quality of service here. Everyone and everything gets the proper attention. Though the menu is limited, the taste sure isn't. There are no special accommodations for children here. Book your next party in one of the private spaces offered here. CJ's Sports Bar & Grill on occasion has some of the best music entertaining you. CJ's Sports Bar & Grill has a full bar available for customer enjoyment. There are no rental facilities offered at this site. Yes, this site can handle wheelchairs. We meet all proper regulations for entrance, seating, and restrooms if available. This establishment offers a combination of affordability and accessibility to allow you access to their services. At CJ's Sports Bar & Grill all credit cards are accepted here. There is most often easy parking here and close by. You may want to call ahead and check on bike parking here. Special prices are this site's speciality. No need for a Rewards Card. WebPage Depot was not able to verify a senior discount. Although not documented, there may be discounts available for military personnel. Adults will feel welcome here. Seniors will feel welcome here. Come on by or give us a call during business hours if you have questions (561) 499-0800. This site for CJ's Sports Bar & Grill was authored to enhance this client's Internet presence and grow the WebPage Depot online business directory. WebPage Depot is designed for local directories and a exhustive business directory. This free business listing site provides a fully functional website. The WebPage Depot site merges seven social media accounts (if available), google maps, large pictures, a contact us page (protecting the client's email address), a link to the client's original website and relevant Youtube videos. Additionally, we write an original text Welcome Message. WebPage Depot does make some assumptions, sanguinely, for the benefit of the client. We write everything from a positive attitude. Our goal is to move-up the visibility/ranking on this site to the highest level possible. Improvements to ranking come with additional relevant content. To continue this effort, we will need news from the client, i.e., menus/list of services, specials, current pictures and videos and additional text for the Welcome Message.